Cover doorways throughout the home with plastic and/or old sheets. This will help keep the dust to a minimum throughout the home. Anything that is not needed during the renovation should be stored in plastic boxes in a location outside of the home. It gets very crowded when homes become littered with overflowing goods from the room that is currently being worked on. With kitchen remodels it is imperative that families find a separate space to set up in. This space should have the family's kitchen essentials. Don't forget the coffee pot! 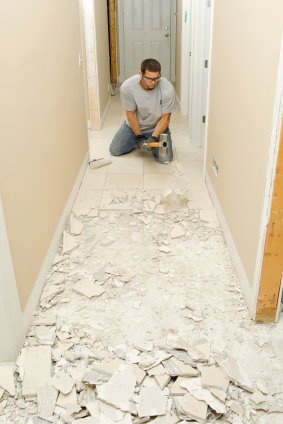 When renovating a bathroom consider the usage of another facility. If your home is limited to one bathroom space it is optimal to stay in a hotel during the few days the shower and toilet are out of commission. Summer time is naturally a busy time for outdoor renovations. Look for less expensive material costs when doing outdoor renovations in early spring or late fall. Consider the seasons when exploring options in home renovations. Heated tile is less expensive to have installed before the tile is in place. Relax and remember you and your family can rely on us. Remember the renovations are a blip in time in comparison to the enjoyment the remodel will bring!